The notion of truth is central to the human condition. “Belief”, “Faith” claim to solve it. But there is a better way: dynamics. BUILD, THEN VERIFY: HOW SCIENCE & TRUTH PROGRESS. TRUTH IS AN ECOLOGY. Abstract: ‘Falsification’ ruled 20th-century science. However, falsification was always second to construction. First construct, only then falsify. Why? As simple as it gets: One cannot falsify something that one has not constructed. Detailed Examples Show That Falsification Is Always Second To Construction: the heliocentric theory jumps to mind. Buridan (~ 1345 CE) demolished Aristotelian physics (no, islamophiles, Buridan was indeed first). Armed with his correct inertial theory, Buridan proposed that Earth turned around the sun. But he could not prove it. Copernicus said more of the same two centuries later: yet it could not be proven. The philosophical argument had been known for 18 centuries: the Sun was the bigger thing, so the smaller thing, Earth, should rotate around the bigger thing. (Maybe some Ancient Greeks thought about another argument, relative to speed: if the Sun turned around, in just a day, its speed had got to be enormous; enormous speeds were unfriendly; if Earth rotated around, it needed to rotate on itself: would the clouds fly away? Aristotle’s erroneous physics said so, but Buridan explained that Aristotle’s arrow experiment was false, by introducing rotary inertia. Kepler came out with his laws, a stupendous achievement. Still one could not prove heliocentrism definitively. It had become the simpler description, though, by a long shot. And then Galileo found that the little things, the four satellites of Jupiter, were rotating around the big thing (Jupiter). Another indice. At this point, there were several independent lines of arguments each pointing at heliocentrism as the most economical, most likely explanation (size, speed, lesser overall rotational inertia (rotational “impetus”, to speak as Buridan did), Kepler’s Laws, Jupiter’s satellites). It was a “beast in the forest approach”: it sounded like a lion, it smelled like a lion, it had the color of a lion, it looked as if it had the ears of a lion. So what of Popper’s “falsification” approach in this? Suppose that it did not have the color of a lion. Does that prove it’s not a lion? No. It could be bright red, because it’s covered with blood, and it’s still a lion. Or all black, because it’s in the shade, yet, still a lion. By 1613, though, Galileo’s telescope had enough power to resolve the phases of Venus (and dare to publish the result). Only then was the heliocentric theory definitively proven, and the Ptolemaic system ruled out. If the way the phases behaved had not come out right, heliocentrism would have been wrong. PPP Venus provided with the Popper Falsification. However, even before that, all astronomers had come to the conclusion that it was certain that the Earth turned around the Sun. Falsification is not fun and cuts down the impulse of imagination. Putting falsification from cognition first kills imagination. Imagination is more important than cognition. Imagination is the definition of the human condition. 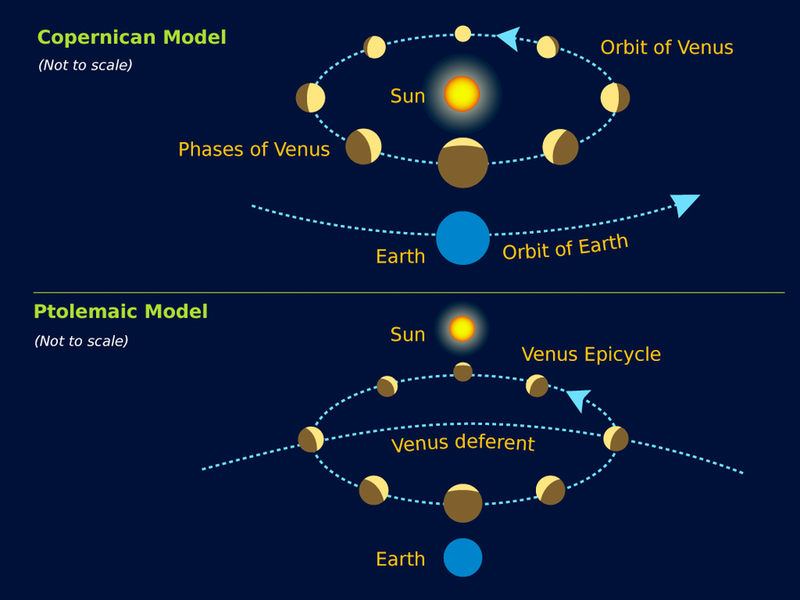 To realize that only the phases of Venus were an incontrovertible proof, one had to have derived the heliocentric theory far enough to come to that conclusion. By the time it became clear that the Venus phases were the incontrovertible proof could be, 99% of the theory of heliocentrism was established. It was a question of mental chicken and egg: neither came first, the theory had to evolve. Actually, the phases of Venus can be resolved by exceptional observers with fantastic eyes, and special atmospheric conditions (the human eye can resolve a minute of arc, Venus apparent size is around two-third of that). As Buridan pointed out, one could not tell the difference, experimentally , between the heliocentrism he proposed and Scripture (so one may as well believe scripture, he added insolently). But that impossibility to falsify did not prevent him to think about it, and to think about it as a science. The Greek philosopher Anaximander of Miletus, before the Persian fascist annihilated Miletus, proposed that people descended from fishes. Later, Aristotle, baffled by fossils, ordered his students to go out, observe and establish a registry of living forms. By then evolution theory by mixed artificial and natural means was well-known in Greece, as related methods produced superlative cattle sold around the Mediterranean. Nobody can know how much was explicitly in writing about evolution (out of 700 Greco-Roman classics we know of, only 150 survived… through the Frankish controlled monasteries). Evolutionary ideas were revived in the Eighteenth Century, until Lamarck proposed the theory of evolution in 1800 CE. Lamarck became quickly an object of hatred from the dictator Napoleon and the Christian Church. A bedrock of his conclusions were microscopic studies of fossils of mollusks (decades behind the microscope destroyed his eyesight). Lamarck was a research professor, not a falsification professor: he invented ideas, and even words: he used neologisms such as biology, mollusk, invertebrate, etc. Lamarck also proposed a non-selective mechanism to explain evolution (as I said above, the Greeks were thoroughly familiar with natural and artificial selection). That obviously could not be disproven, and the mechanism was completely unfathomable. It is only now that epigenetics has been demonstrated to exist, and some mechanisms explaining it have been made explicit. We build theories, first. Then we test them, always. First build. Those who don’t want to build, don’t want to falsify. To assuage and pacify the Neoplatonist leadership of the Roman empire, the evangel of John proclaims in its first few sentences that the “logos” was God, and God was the “logos”. In other words, logic, the discourse, ruled the universe. Now the “logos” itself is its own truth: any logic defines a propositional truth from its axioms: well-formed propositions are “true” in a sense. HOWEVER, propositional truth is not ALL the truth in a logical system. That observation is the key to the problem of truth. Moreover, there is the problem of meta-truth. Meta-truth evolves out of truth (Godel famously proved that meta-truth existed). Logicians have been struggling with both non-propositional truth and metatruth (Godel’s proofs were proofs of existence, and did not provide with an explicit mechanism to build metatruths; later Godel and Cohen rolled out axioms which were independent of others, and thus could be considered true or not). The preceding shows that building a scientific theory is a built-up of truth: Popper’s work was naive, removed from reality. Still, although truth evolves, that does not mean there is no absolute formal truth. There is: planes fly, don’t they? For a plane to fly one million formal truths need indeed to be true, at the same time, or the plane would crash. Thus one can see that truth does not evolve like a species: metatruth evolves like an ecology does, generating on its way perfect species, local truths. An ecology evolves perfect species, such as sharks and oysters, which barreled, same as they always were, through massive extinction waves in the last few hundreds of millions of years. Evolution also produced species whose main business is to evolve, such as hominins (ourselves and all those cousins of us we used for dinner, in the past). So, in the evolution of logic and metalogic, perfect truths are produced, so perfect they become part of the logos themselves (truths such as realizing that love is the engine of all things human!). God is truth, and we make it up, as we debate reality with our imagination. P/S: The essay is better appreciated if one is familiar with 20th century philosophy of science (and it penetrated the exercise of science itself, especially physics). Karl Popper claimed that, if a theory is falsifiable, then it is scientific. However, if I say, tomorrow the sky is blue, that’s falsifiable, but not necessarily scientific. The Popperian criterion excludes from the domain of science not unfalsifiable statements but only whole theories that contain no falsifiable statements. That’s silly, because Popper wanted to ‘prove’ that Marxism was not scientific… Yet clearly the work of Marx contains falsifiable statements. Moreover, Pauperism leaves one with the Duhemian problem of what constitutes a ‘whole theory’ as well as the problem of what makes a proposition ‘meaningful’. My approach above pretty much throws the whole thing through the window. Science has to do with truth, and metatruth, which have architectures of truth, just as a building or a plane have them.